May 1972 The center was officially recognized under its present name, Research Institute for Higher Education (RIHE). It was the first specialized research institute for Higher Education in Japan. April 1986 RIHE launched a postgraduate training program in higher education, which became part of the Graduate School of Social Sciences of Hiroshima University. 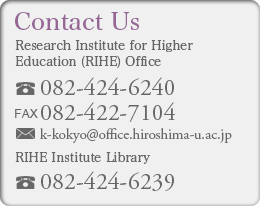 April 1995 RIHE moved from Higashi-senda Campus (Hiroshima City) to Higashi-Hiroshima Campus (Higashi-Hiroshima City). April 2000 Postgraduate training program became part of the Graduate School of Education at Hiroshima University, and a new Higher Education Course was established at the Graduate School. The research organization at RIHE was expanded and divided into five divisions: International Higher Education; Curriculum Development; System of Higher Education; Admission, and Research Visitors. 2002 – 2007 RIHE was identified by the Japanese government as a national center of excellence and was designated as one of twenty such Centers in the Humanities. It is the only Center in Higher Education to be given this status. Special grants to RIHE will allow an extensive program of research into policies and programs for 21st century higher education. April 2005 Bilateral Agreements was concluded between RIHE and Center for the Study of Higher Education (CSHE), The University of Melbourne, Australia. October 2006 Bilateral Agreements was concluded between RIHE and Graduate School of Education, Peking University, China. October 2006 Bilateral Agreements was concluded between RIHE and the Graduate School of Education, Peking University, China. 2008 – 2012 RIHE began operating a project under the title “Strategic Research Project on University Reform” to respond to the knowledge-based society in the 21st Century which was approved by and received a grant from the Ministry of Education, Culture, Sports, Science, and Technology (MEXT). 2010 – 2012 RIHE was funded by Japan Society for the Promotion of Science (JSPS) for Young Researcher Overseas Visits Program for Vitalizing Brain Circulation. 2016 – 2021 MEXT provides preliminarily funds for the program of cooperation research base.